Top Five Captian Kirk Moments in a Star Trek Feat. -Cheese is encouraged, but not necessary... A Must! In this scene Kirk gets in a fistfight with a shape-shifter... who has taken the form of Kirk. There is quite a bit of banter (and fists) between the two and considering the VFX capabilities at the time it’s pretty well done. The montage is a little wonky, but the scene’s content as well as Shatner’s killer line delivery makes it a really fun scene. This will forever be my favourite Star Trek scene. It’s an internet "lol-meme" classic (for all the geeks like me out there), and on a more personal note, all throughout high school my best friend and I would run around school quoting the scene daily (complete with furious Shatner yell). In all seriousness, once you get over Kirk’s goofy awesome facial expression the scene is actually edited very well. 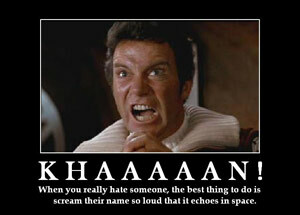 Kahn is obviously frustrated and the tension between them is so tight that eventually you realize that the furious Shatner yell is the only thing that can release it. Here I’m referring to the scene near the beginning where Spock’s father is joining minds with Kirk thinking that Spock would have transferred his soul to Kirk. It’s a relatively short scene that involves extreme close ups almost exclusively. The scene is a great example of choosing great takes; emotion can be difficult to convey in an extreme close up. This is especially true for showing eyes, because just as they say "the eyes are the windows to the soul," and if the emotion isn’t there, even the editor will have a hard time with it! Just like #4 was Nina’s favourite Star Trek movie scene, this is Nina’s favourite Star Trek movie (and it’s not just the San Francisco thing, jeez). This scene is very straightforward when it comes to cutting, seeing as it’s a basic dinner table scene (cut from one person to the alternate view and back, etc). What makes it great is the timing. Kirk is saying some seemingly absurd stuff (at least to whale lady) but is also trying to be serious and suave at the same time. ...and this is done in a way that only Captain Kirk (helped by the editor, of course) can pull off. In this scene, everything is done right. The montage is smooth, the pacing is great, and Kirk is thoroughly quirky in all the right ways. The viewer also gets a good sense that time is not a factor (just like everybody keeps talking about concerning the "Nexus" where Kirk is trapped), almost as if they are in a peaceful place that’s not real. Something is always just a little off. I think that has something to do the cutting pace, but I can’t put my finger on it. I can't think of anything more scary than having a robot from the future relentlessly hunt you down because of something you haven't done yet (and didn't even know you were planning to do). Well, maybe I can think of a couple scarier things, but really, robo-Schwarzenegger is pretty high up there! Being thousands of feet underwater is scary enough without stumbling upon some kind of creature that no one has ever seen before, but when the team does find that "thing" then it's up to the editor to carry not only the story, but the suspense, the action, and the fear. Well excUUUUUUUuuuse ME! Steve Martin has been most commonly known to do comedy, and as I've explained before, comedy has everything to do with timing. 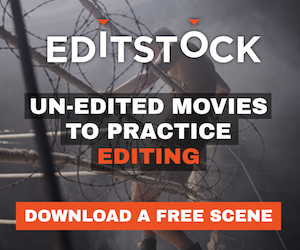 In film, the editing plays an integral part in that timing. Rendering is always one of those things that create dead time during a project. This is especially true for the independent freelancer with the last generation of equipment. But there's no reason to let that time go to waste! As a composer as well as an editor myself, I've always found that there seemed to be a direct correlation to the construction of music to the art of editing. The pictures to the editor are like the notes to the composer. This is exceptionally illustrated with animation. Fantasia is a great example. I've heard many times from many a wise person that the greatest artists were also the most insane or tortured. Looking at history, this is arguably true. Unfortunately for them, of course, it's a rough life, but their ghosts can take solace in the fact that their work has moved many generations beyond them. Their lives make great stories, too. One of the musical-turned-movies that has always been close to my heart is Grease— I remember growing up and watching that movie, learning all the words to the songs (which I can still sing along to), and thinking that the social dynamic in high school would basically be like that. Well, I learned that that last point wasn’t actually the case in the real world, but at least I can nail every song at a karaoke bar. Christopher Guest and his crew of equally talented and funny friends managed to create a particular standard for a genre of film, which is difficult to pull off if you don’t know what you’re doing. I myself come into editing with a documentary background, and as anyone who does documentary knows, in some situations it can be hard to keep continuity when events are unfolding in front of the camera before the operator has time to plan. This is where the "mockumentary" has its advantages (being able to consciously fill the holes) and disadvantages (filling those holes make it less of a documentary and more of a drama). To make it still have a raw documentary feel the editor needs to have a keen understanding of the subtleties that will fake it realistically. Different genres call for different editing techniques, but sometimes movies don’t really fit any particular kind of genre and as an editor, you just kinda have to go with it. <i>True Stories</i> is one of those movies— it’s borderline comedy and musical, but it’s mostly an entertaining commentary with music. Because it’s done so well, it’s made its way to my personal top 5 movies— and while it is obviously somewhat low budget, technically speaking, the editing ultimately helps to keep it entertaining and progress the story.